Offering clever prompts and space to doodle, this book lets you remember relaxation time with friends. Social couch potatoes rejoice! 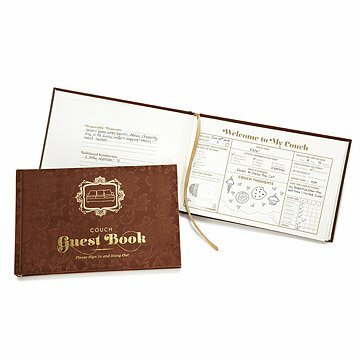 Keep track of your movie night partners, game day co-fans, and binge-watch buddies with this visitors book. Offering clever prompts for your guests and space to doodle, this fabric-bound book lets you remember makeover show marathons, gossipy catch-ups, and relaxation time with friends--they can even grade the ambiance and rate the overall couch experience. Made in China. This made for the perfect housewarming and birthday gift, and arrived just in time for the housewarming party. She loves it. It just fits. My son-in-law has "his" place on the couch where he watches a lot of sports and movies. I think he will get a kick out of this, and so will his family and friends. Very fun gift for friends! I crashed a friend's couch for weeks when college housing became unavailable... This was a great thank you gift! This is a fun gift with questions and suggestions to people hanging out on your, or a friend's couch. It's cute and nice enough looking to actually keep on a coffee table. Kind of a purposeful gag gift! I recently stayed with a woman that I vaguely knew 20+ years ago and her new husband. They were kind enough to offer their hospitality, and the book was a great icebreaker. They left it displayed on their coffee table so I filled out the first entry on my last day. Great host/hostess gift! My friend had seen something like it but not near as nice and she had been wanting one. Gave to a family member who is moving into a new place but often allows family and friends to stay in her home while she travels. It's a great gift for someone who is a minimalist and not looking for lots of clutter-type items. More like a coffee-table book but interactive! The photo does not do this book justice! I got it for my grandparents and it has been a big hit on their coffee table! They love it and all their family and friends love it! I have gotten a lot of credit as a "Great Gift Giver" for this gem!